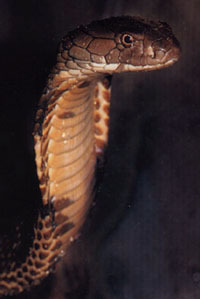 The King Cobra's biome is the Southeast Asian rainforest. Its habitat are the clearings, bamboo stands, and edges of the forest and it is also commonly found near rivers and swampy areas. The climate that the King Cobra lives in is rainy and humid. The average temperature is usually 95°F. The King Cobra can grow up to 12-18 feet. Adults weigh 12-20 pounds. Their fangs can grow a 1/2 inch. Their color is olive, brown, or black. The underbelly is creamy or pale yellow. The King Cobra's generic name means "snake eater." a year. They lay 18-50 eggs. When the eggs are laid, it takes 70 to 77 days for the eggs to hatch. When the eggs hatch the young are 12-25 inches in length. Its average life span is about 20 years. Cobras are solitary and the male does not help to raise the young. The King Cobra forms a hood when it feels threatened. When threatened, it also raises up one third of its length and may sway toward you. It will also sometimes expectorate (spit) in its prey's eyes which stings and will kill rapidly if it gets into the blood stream. The poison is also a special adaptation that paralyzes the nervous system of its prey, which is often larger than itself .The King Cobra is the only snake that builds a nest and guards it until the eggs hatch. The King Cobra is a carnivore that eats mainly other snakes, but will eat lizards, some frogs, and sometimes small mammals. Some of the main predators of the King Cobra are humans, the mongoose, and birds of prey. The cobra mainly preys on the other snakes, even venomous ones. Since the rainforest is being cut down, the King Cobra is put at risk. Wildlife sanctuaries could be created to created to help preserve the habitat. McCarthy, C. (1987). Poisonous Snakes. New York, Aladdin Books Ltd.
Klum, K. "King Cobras", National Geographic, Nov. 2001, Vol. 2, No. 5 pages 100-113. Marven, M. & Harvey, R. (1996), Snakes, New Jersey, Chartwell Books. World Book Millennium 2000, The World Book Encyclopedia, (2000), Chicago, IL. Vol. 3.